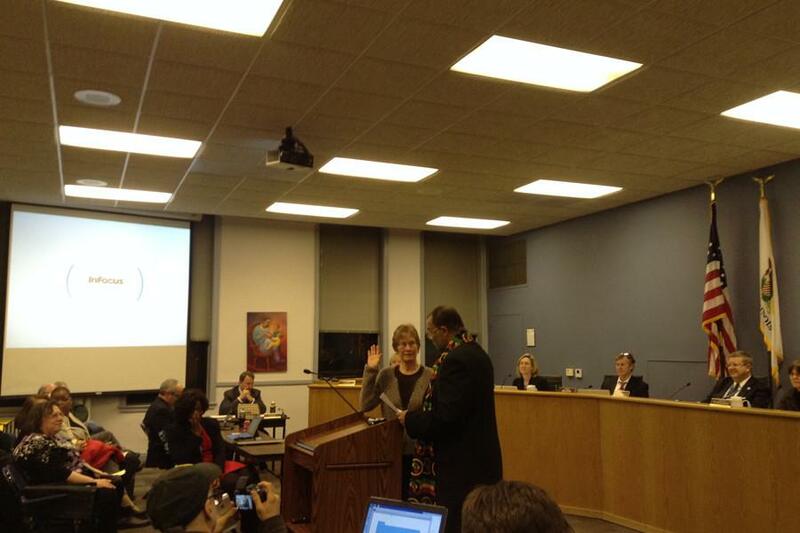 Eleanor Revelle being sworn in as 7th Ward alderman at City Council on Monday evening. Revelle will replace Jane Grover, who vacated the position in December. Eleanor Revelle was sworn in as the new alderman for the 7th Ward at Monday’s City Council meeting, where she said her focus will be on sustainability efforts. Mayor Elizabeth Tisdahl chose Revelle in January from a pool of 10 others who expressed interest in the position. She replaces former alderman Jane Grover, who resigned in December to start a job as the outreach principal for the Chicago Metropolitan Agency for Planning. Revelle is the current president of Citizens’ Greener Evanston and previously held positions as president of the League of Women Voters of Evanston and board chair of the Evanston Community Foundation. Revelle will hold the seat until next year, when the next round of aldermanic elections are set to occur.